The art of telling a story in pictures is directly linked to expressive photography. As I’ve noted at the beginning of this cyberbook, expressive imagery is usually abstract, incongruous and represents human values we all can understand and relate to. When we tell a story with a picture, or with a group of pictures, we usually fuse elements of abstraction and incongruity in order to convey an experience rooted in human values. I am actually telling stories with my pictures throughout this cyberbook. It is just the way I express myself. I am, both by training and nature, a visual storyteller. My roots are in photojournalism, which is just another word for story telling. Historically, story telling is an oral or written process. But with the advent of photography, film, and television, visual story telling has rightfully taken its place as a medium of expression. It is what I do. In this gallery, I offer specific examples of travel images that focus on story telling. These stories are non-linear. They do not attempt to offer viewers a beginning, middle or end. Instead they interpret the facts of a story in an abstract and incongruous way in order to express those essential human values we want our viewers to understand and appreciate. If I can create empathy, and let the viewer identify or vicariously live through what I experience as I make my images, all the better. What I am doing is practicing the art of visualization – by making an image that triggers emotion and thought, the viewer can not only view my image, but also see images in their own mind’s eye that may go well beyond my own. Story telling is actually a process that continues within the viewer’s own imagination, allowing them to make their own stories out of mine. I launch this gallery with a selection of such images, photographed in Singapore, Malaysia and China. I hope to add more examples from images made on my future travels. I present this gallery in "blog" style. A large thumbnail is displayed for each image, along with a detailed caption explaining how I intended to express my ideas. If you click on the large thumbnail, you can see it in its full size, as well as leave comments and read the comments of others. I hope you will be able to participate in the dialogue. I welcome your comments, suggestions, ideas, and questions, and will be delighted to respond. Huge limestone rocks fill the shoreline of what remains of Herod the Great’s Harbor in Caesarea. Dozens of cats scramble among them – their ancestors have lived here for centuries. 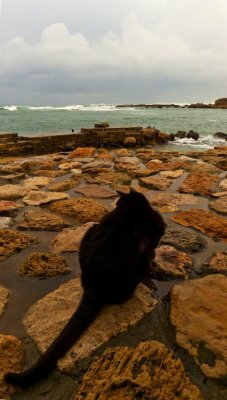 I found this black cat perched on one of those rocks, looking out to sea in a light drizzle. The cat anchors the foreground, its tail lodged neatly in the lower left hand corner of the frame. The colors move us through the image; beginning with the richly saturated rocks, back through a pale green sea, to the white crest of the crashing waves, a blue gray sky, and looming rain clouds in the background. The image is timeless – the cat represents continuity that defines the nature of this ancient place. What is going on below those pointed ears? The image makes us think like a cat. Our cruise ship passed the length of Egypt’s Suez Canal, a 120-mile long single lane of water connecting the Red Sea to the Mediterranean. It handles more traffic than the Panama Canal, and is a critical strategic factor in the world economy. 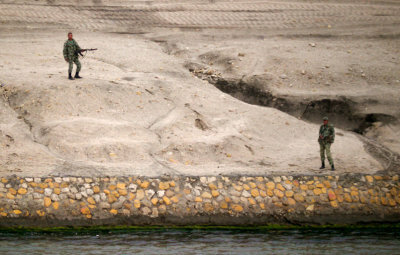 The Egyptian army has deployed troops along the length of the canal. I photographed two of them guarding this spot of desert along its banks. Weapons in hand, they stared at the passing cruise liner as if it was an apparition. Once again, I ask the viewer to imagine what they might be thinking. Two men, alone in the desert, guarding one of the most essential waterways on earth, suddenly look up to find dozens of waving cruise passengers floating by. 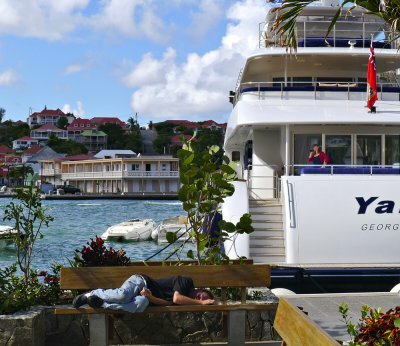 It is early afternoon in St. Barts marina on New Years day, and a man sleeps off the effects of the previous evening’s celebration. Only a few yards away, a woman standing on the rear deck of a massive yacht enjoys a phone conversation with someone who may be on the other side of the world. I juxtapose the two situations – neither person is aware of each other, but we are aware of both. The story here expresses a contrast of levels: energy, social, and economic. I leave it to my viewers to draw their own conclusions. I roamed the streets of St. Barts on New Year’s morning. Some of the town’s bars had not yet removed the residue of revelry from the previous evening. This image tells the story of the morning after. 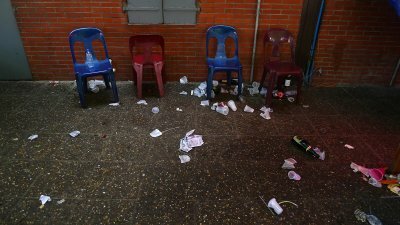 The image is silent – featuring four empty plastic chairs awash in smashed cups and empty champagne bottles. The revelers are nowhere to be seen. 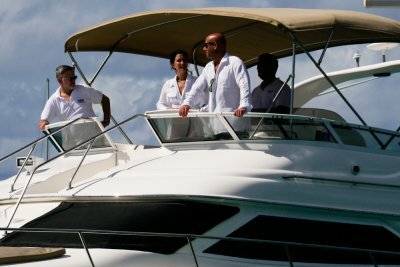 The world’s money seemed to converge on tiny St. Barts in the Caribbean to celebrate the arrival of 2011. Dozens of huge yachts were anchored in the town’s marina, each of them bearing massive satellite communications gear. 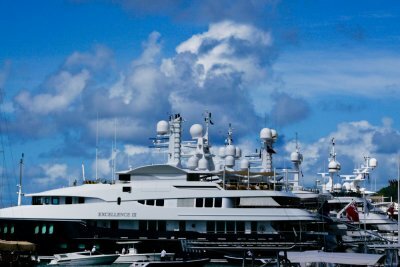 I photographed the scene with a long lens, compressing the yachts into a single entity under a soaring cumulus cloud. It tells the story of wealth, and its attendant perks. One of the many luxury yachts cruising St. Barts harbor on New Year’s Day sweeps by my camera, and I zoom in on its bridge to tell a story of command. Four people share space here – three are in the light, one works in the shadows. The dynamics of positioning and body language within that space tells a story in itself. I assume the fellow in the shadows is piloting the yacht. The other three people may belong to the crew or they may be passengers. Perhaps someone in this gathering may even own this yacht? The man at left keeps his distance. He seems to be an observer. The man and woman share space together, front and center. She looks attentive. He wears sunglasses over his eyes, and another pair hangs from his shirt. He grips the yacht’s windshield. Of them all, he seems to be in charge here. We can’t know the actual story expressed by this image. The facts rest on the surface, and we can’t dig behind them. However our imaginations are free to prompt us to draw our own conclusions. 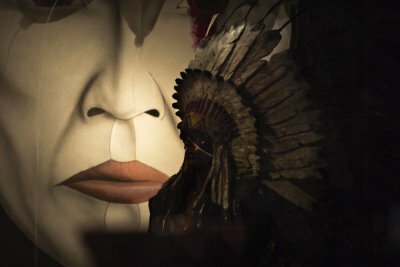 In this image, I juxtapose an enormous stylized painting of a Native American against a traditional Indian war bonnet. I abstract the face in the painting by cropping it just below the eyes so that the face seems to be unable to see. Barely visible in the painting are the ends of feathers that enter from the top of the frame. The war bonnet, however, is seen in its entirety, yet it appears much darker than the painting, as if lost in time. My juxtaposition tells the story of vibrant Native American cultural pride, yet a pride tempered by a history of war, oppression and suffering over the centuries. It is a simple image, yet one that tells a story that resonates with history. We encountered a group of ponies grazing at the base of one of Monument Valley’s famous buttes. Our presence obviously spooked them, because as soon as we arrived, they scattered. Two of them plodded past me, heading towards the prospect of food. I filled the foreground with grasses, representing such sustenance. A huge bush dominates the image, making the ponies seem small in comparison. A berm of compacted red sand fills the space behind them, removing all traces of sky and plain. The small horses belong to Navajos, possibly descended from horses originally brought to this place by Spanish conquistadors 400 years ago. 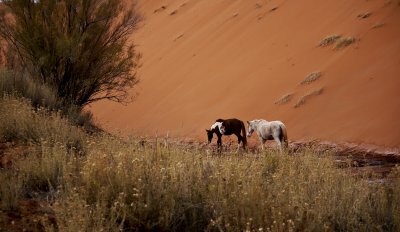 The horse became a critical component of Navajo culture, originally providing transport for their nomadic lifestyle as well as giving the means to fight the Spanish and predatory Indian tribes. Today the Monument Valley Navajo use the ponies to offer tours and trail rides to tourists. The pitted, scarred walls on the corner of a building near Bucharest’s university tell a poignant story of protest and death. It all began twenty years ago when Romania’s Communist regime fell. A cross at left speaks of a killing at or near this spot, most likely that of a university student. 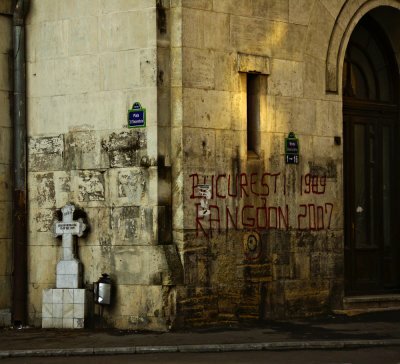 On the other wall, someone has written in blood red letters “Bucurest 1989,” and “Rangoon 2007” matching Romania’s struggle against a totalitarian regime with a cotemporary struggle in Burma. There is still another story being told through the colors and textures in this image. The residue of hundreds of posters -- dried paste from various student protests over the years -- remains vividly evident. Although those posters are gone, their echoes will not be easily forgotten. 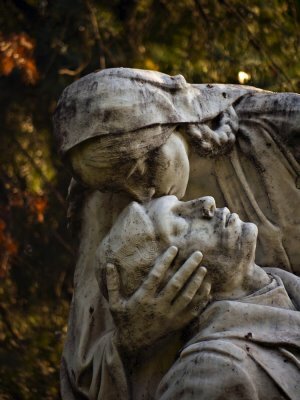 This Carrara marble sculpture by Ion Jalea, depicting a dying French soldier being comforted by a loving embrace, is Romania’s tribute to the French soldiers who perished here during World War I. I zoomed in on to the faces to reveal the ravages of time on the marble and tell the story more intimately. The once pristine faces, revealing ninety years of grit, seem to imply that the battle still continues. The long 400mm focal length of my lens has turned the background of leaves and flowers into a softly focused screen resembling stained glass, adding a mournful context. 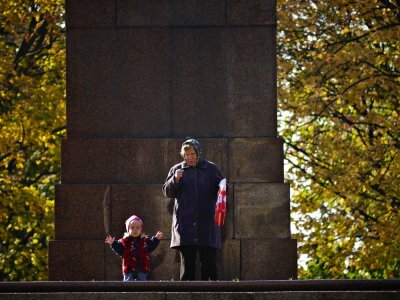 We came upon a group of people doing exercises together in this park, but my gaze shifted from them to this pair of spectators who stood above them on the base of a monument. A young child takes her cues from her own personal trainer, and I photograph her mimicking the gestures of the exercisers that labor out of sight just below her. Some might wonder why I chose to leave out the exercisers? My answer is simple – I would rather leave room for the imaginations of my viewers to enter the story. Expressive travel photographs often work in tandem with words, and this image would best require a caption or accompanying article that would add the necessary context. I don’t believe in ghosts. But after a visit to the Hotel Congress in Tucson, I am no long so sure of myself on this point. The hotel, built in 1919, is widely considered to be haunted. The front desk manager kindly allowed us to go upstairs and visit rooms that were in the process of being cleaned by the maids. I asked one of the maids if she had ever felt the presence of a ghost. She said that the door to Room 214 often closed by itself when she propped it open. 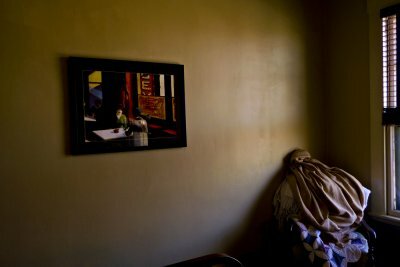 I watched her clean Room 214, and as she worked, I photographed a pile of bedclothes that she had temporarily placed in a chair next to the window. It looks eerily like a person. The 1920s painting on the wall adds to the illusion. When the maid finished cleaning Room 214 she turned off the room's radio that she had been listening to. I stayed in the room for a few moments, and the radio mysteriously came back on again. I asked the maid about it as I left. She said it happens all the time. When I look at this image of the “person in the chair” and the 1920’s painting on the wall, it makes me question my own certainties. Thanks, Marco, for your kind words. I hope you will find these images instructive. That is why I post them. I know you love to tell stories with your own pictures, Chris. And both you and I use human values as a basis for our story-telling. Thank you, as always, for your kind words. I love the expressive photography and this project is so strong in values and stories Phil. My big compliments as always. Thanks, Tricia, for your words of encouragement. I am always delighted to help others learn about expressing ideas, and often such ideas can tell a story as well. And that is why I've posted this gallery. I like this gallery, Phil. You have alot to share and teach here about story telling. I cherish your words, as always, Celia. You are right -- this gallery is, in essence, what my site is all about. Thanks, too, for the suggestion to move it up near the beginning of my cyberbook, because of its importance. However, to do so would break the continuity I've established by placing the most recently added galleries last. But I will give it some thought. It is a very important addition to my cyberbook. You are right, Celia -- story telling is at the core of what I do, and what you choose to do as well. And as you say, it is an art within an art. Thanks so much for the kind words and the good thoughts. This gallery is a fabulous addition to your site which should have appeared way at the top as one of your first few galleries - because it is in essence what your whole site is about -expressing stories, values or ideas about a time...a place... or people that go beyond mere description. I think your images are beautifully composed but more importantly, they all have a voice that draw the listeners (viewers) in, the way a story teller does. It is easier to engage the viewers when you can offer more substance that lead to thought, curiousity and reflection. This is infinitely more rewarding to a photographer. I may be biased but I hold this body of work dear to my heart because story-telling is the main reason I got into photography. And it is breathtaking to see how you've made this into an artform Phil! Thanks, Charu -- it is good practice for you to read the image first and see if you can guess what I am going to say about it. However, be sure to note that the story each image tells may well differ from viewer to viewer. That is the beauty of expressive story-telling photography.